So I finally ticked an item off my bucket list and as promised, I’ll share my experience. Ok!! I actually walked 24 kilometres and it was the most difficult thing I have physically had to do. I feel like I had my body panel beaten. 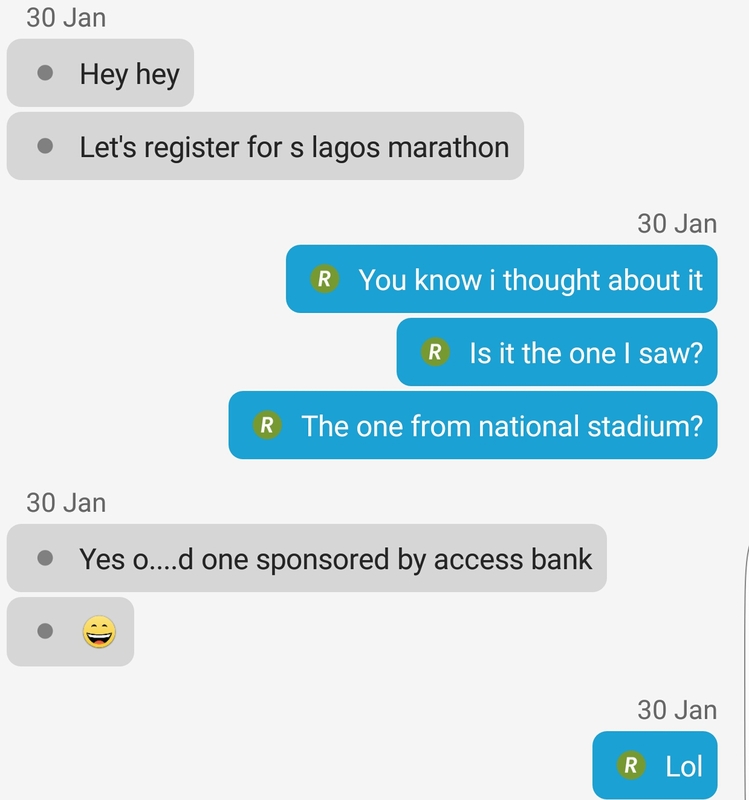 I was going through my instagram @phaytea when I saw the Access Bank Lagos City Marathon advert billed for the 11th of February 2017. As usual, my first reaction was to procrastinate. I gave myself these reasons not to register: I’ll find another one later, this is a city marathon and the crowd will be much, I don’t like crowded places, a charity walk will be preferable, I am not exactly looking to join a long distance walk, 42km is a lot plus my childhood friend will be wedding on the 11th of February 2017 and I’ll be in Abuja (sigh, so I thought)…I had too many reasons not to register. Like two weeks later, I was at work when I got a message from a friend. 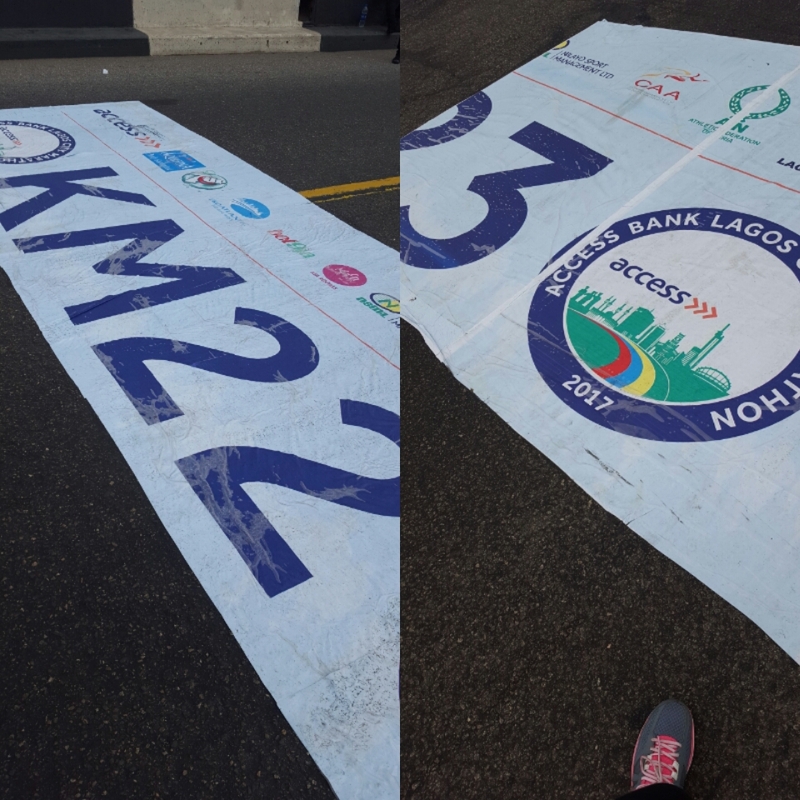 It read: Let’s register for the lagos marathon. I smiled when I saw the message because I had already started deliberating, so I went for it. Registering online became a hassle and I just thought I should not even bother anymore ( Plus I really needed to be in Abuja). My friend finally got me registered as I was not even ready for the extra work the site was trying to put me through. The day to pick up our kit came and I was ready to head back home as soon as I walked into the indoor sports hall at the National Stadium and saw the number of people waiting for the same purpose I came. What more discouragement did I need? Another friend who picked up earlier confirmed she had to sit through the crowd to get her kit. What!! Sigh…I waited anyway. Fortunately, the coordinator came to address the crowd and said he was going to give priority to some women. Yaaaay!!!!! He picked me and three other ladies to start the process. Thinking that was easy, right? No way. It got to my turn and I was told my registration detail was yet to reflect on the platform (whatever that meant). Sigh! However, Instead of telling me to go home and return three days later, i was referred to some other guy who could assist with uploading my information on the platform. Not sure what that meant too but my walk-athon started there as I had to walk a distance to meet this man that could help sort out my details. I got my kit finally and left. There was no african time. The race started at 7:00am prompt to my surprise and that of some other people. I had to wake up at 5:30am to be at the stadium for 6:00am. Of course there was traffic and I didn’t get there till about quarter to 7am. I had barely reached the gathering of other runners when I realized they were already moving. I joined immediately, starting with light jogs. A little after 1km, I knew jogging was not made for me🙈🙈. I resolved to walk all through the race. A few other people shared my sentiments as well because there were too many of us actually just walking. The marathon (well, walk-athon for me) was a nice experience and was definitely the motivation I needed to walk a really long distance. I had my doubts regarding crowd control, security and first aid but to my surprise it was well planned. 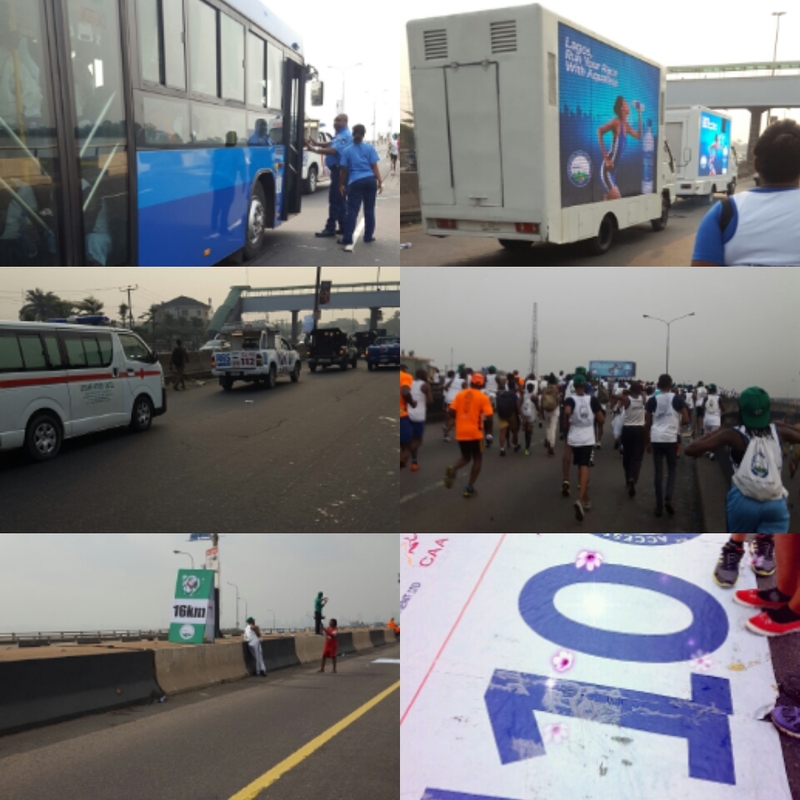 There was adequate security, lots of water and 7 up for hydration, lots of emergency vehicles/mobile clinic were deployed for the race and buses were available to pick participants who could not continue walking or running.I was totally impressed. I did a happy dance after every kilometre and just tried to keep the pace as it got more difficult. However, it dawned on me that it was wrong not to have read up tips for joining a marathon or even walking long distance when someone actually fell in my presence. The ambulance arrived immediately but that did not stop me from getting worried. I was so shaken and decided to reduce my pace even further as i did not have breakfast before heading out. In all, I will say the experience was worth it. I like that I pushed myself and left my comfort zone. 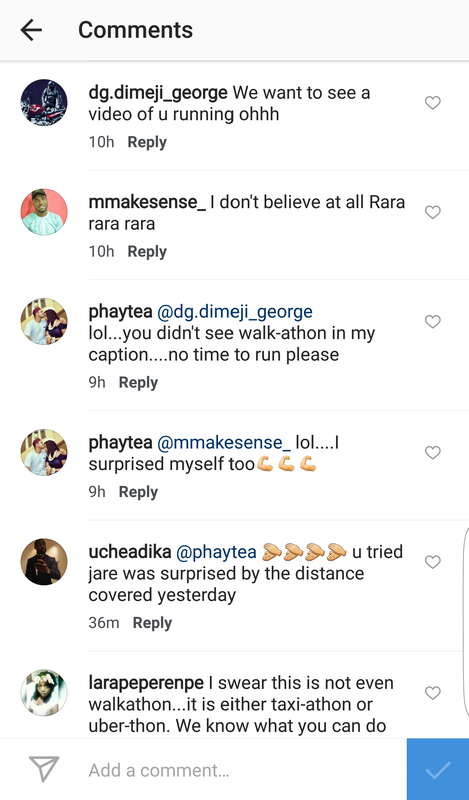 I could not believe I actually walked 24 kilometres and my friends thought the same too. I got the most hilarious comments on instagram. I finally joined the bus at 24km and rode to the finish line where the winner had since arrived. I hear he is a Kenyan athlete (Abraham Kiptum) who ran during the first edition of the marathon in 2016 and won in two hours sixteen minutes. 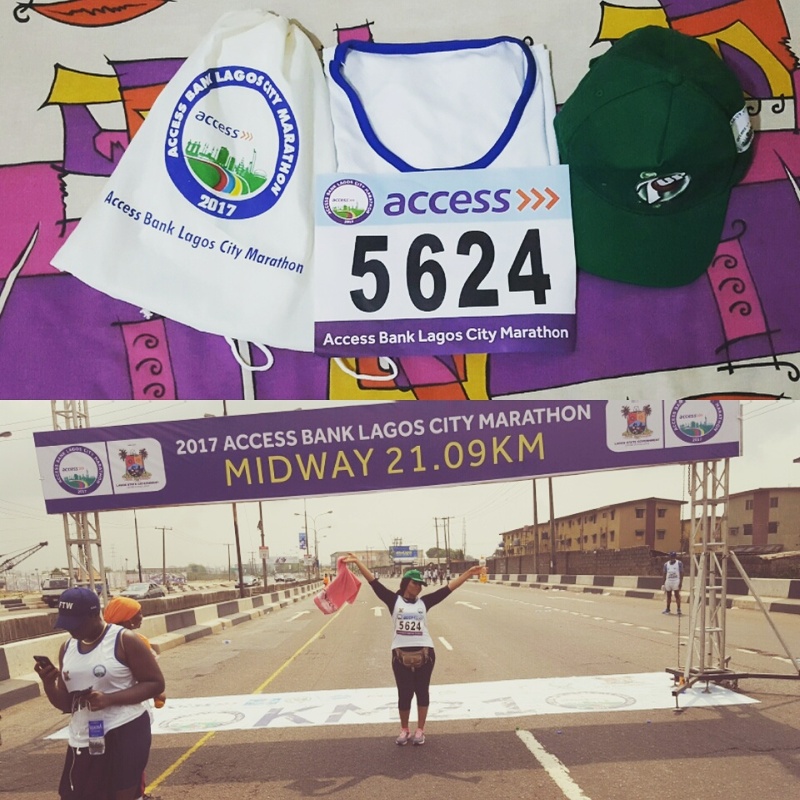 This time, he won the Access Bank Lagos City Marathon 2017 again in two hours ten minutes. Amazing right???? Ps: Presently taking the couch potato position while watching the Big Brother Nigeria Eviction Show. I also hope I can make it to work tomorrow. Have you ever participated in a marathon or long distance walk? Do share your aftermath experience. Wow! Good on you for doing such an amazing challenge. I feel like I’m getting slower and more sedate as time goes by – 24km is really great. Hope your poor body recovers quickly. Love your writing style. I keep trying to get myself to sign up for a marathon (definitely in the walk-a-thon category) but so far I have managed to find a good excuse every time! Good for you and congratulations. It is a fabulous feeling when you cross that finish line and you never know you might catch the bug and keep entering. I started at 50 and now this year will be 60 and still entering fun runs. So keep up the good work and be fit, fabulous, healthier and happier.